Stephanie Yamkovenko deciphers the details that make life interesting. 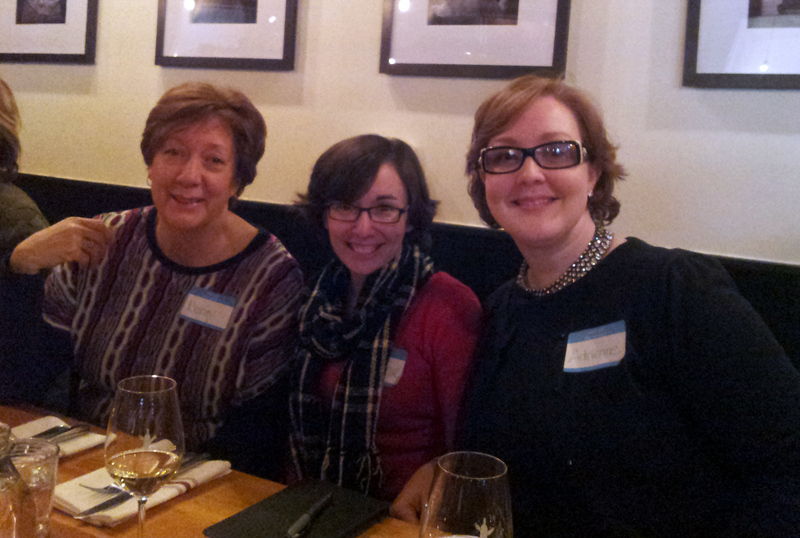 Thanks to a friend (Adrienne Lawrence) I had the opportunity to attend an event for journalists and bloggers today. 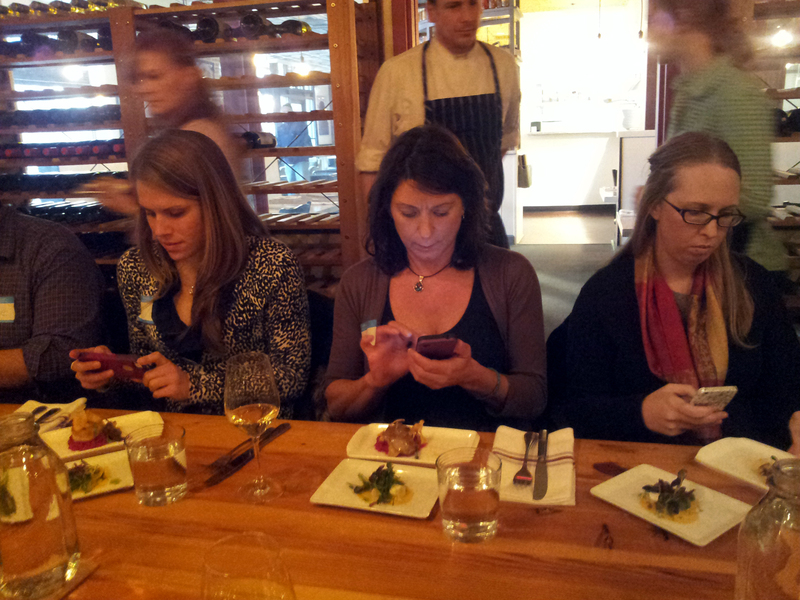 As a kickoff to Frederick’s Restaurant Week, 15 bloggers/journos are invited to a sneak peek tasting of the participating restaurants’ menus. Sure I could write about the Monocacy Brewing company’s beer, the Bushwallers menu that is much more than pot roast and chicken wings, the exquisite experience that is Firestone’s Tavern, or the “room full of kittens” of the Wine Kitchen’s oddball Chardonnay description. (Don’t you worry – I just might write about those things in future posts). All of those things could be a story, but what was my story? I’m sure you all have experienced it. You go to an event expecting to meet people and you quickly realize that everyone else is here to tweet about being at the event. The phone is snapping pictures, the face is illuminated by the screen as the person taps and swipes and posts, posts, posts. Full disclosure: I was 100% certain that this event would be just like that. Of course we took pictures of the food. Of course we sneaked in a tweet here and there. But I was pleasantly surprised when the five people in my group spent the majority of our time talking. And laughing. We talked about the food and wine we were tasting. We talked about our work. We talked about gardens, nutria rats, and why there isn’t a grocery store in Downtown Frederick. It got me thinking. Has the pendulum swung back? Are we finally to the point where we realize the phone is the refuge of the introvert and that to truly network we need to, well, talk face to face. Or maybe my group was a fluke. I’m so meta. That’s a notebook and pen on the table. I hope not. And I hope that it’s something I continue to encounter at future events. I know that I, for one, will try to stop tweeting and start talking. Picture + 100 Words: A European-like Town in the U.S.
You probably know that I like traveling to Europe. One advantage of living in Frederick, MD is that sometimes you can imagine you’re in Europe (without the 8 hour flight). 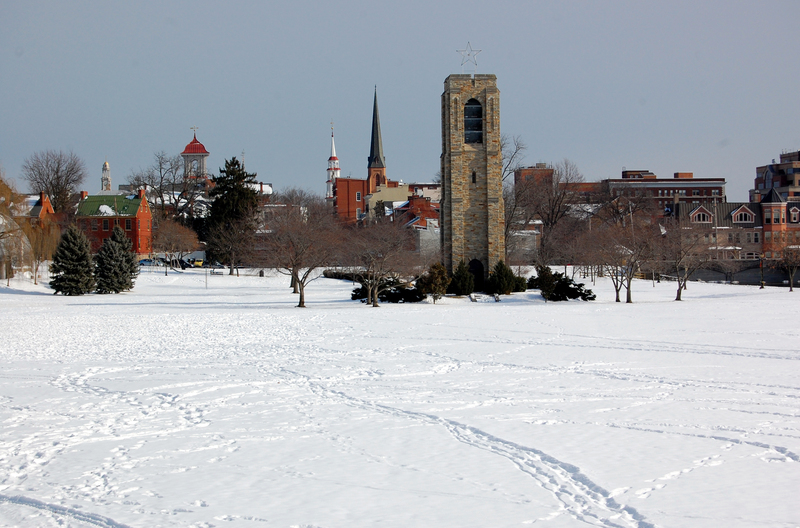 Like from this view point: spires dotting the horizon, white snow covering the city’s main park, charming brick buildings. But you also get this European vibe throughout the city’s downtown. In front of city hall. On Market Street. Sitting in the cafes. 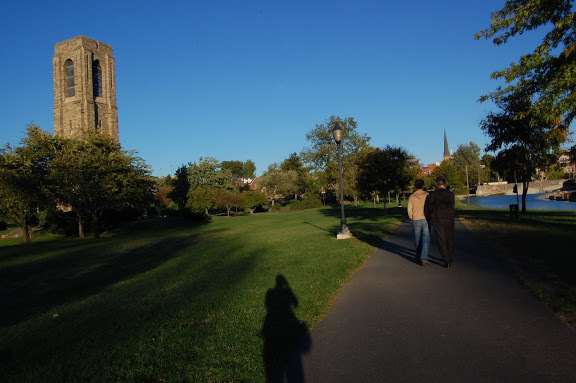 Or taking a walk through the beautiful Baker Park. 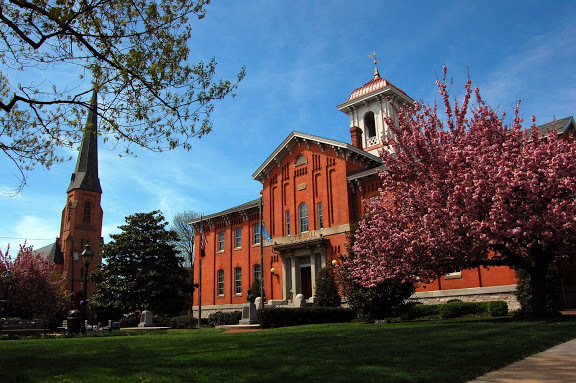 If you’re craving Europe but don’t have the time or money for the trip, check out Frederick instead. Last week, on Tuesday, it was the coldest it’s ever been since we moved to Maryland in 2008. The high for the day in Frederick was 14º. This winter may have had the coldest day, but it definitely hasn’t been the snowiest (at least, not yet). That happened in 2010. Snowmageddon. 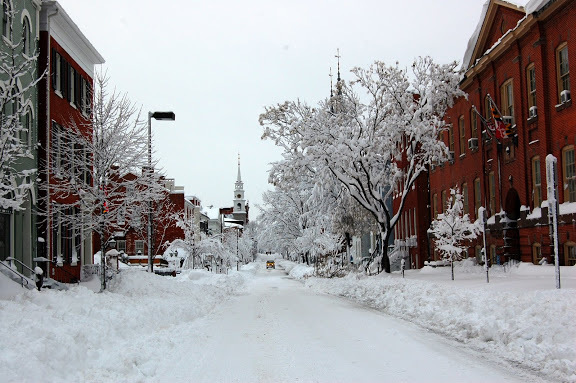 This was Frederick’s Church Street after that storm. By that point we all wanted to get out of the house. This week’s temps have hovered around the 50s, making many of us think of spring. But just a reminder, friends, Snowmageddon was in February. Who knows what’s next. Last year’s Thanksgiving was a bit strange. We ate pork knuckles and sauerkraut washed down with large glasses of German wheat beer. Although no one else at the restaurant was celebrating America’s Thanksgiving, there was a general festive attitude among the diners and throughout the city. You see, right around Thanksgiving is when Advent starts. And in Europe, Advent is a huge deal. I was not aware of this until I saw it in person last year. 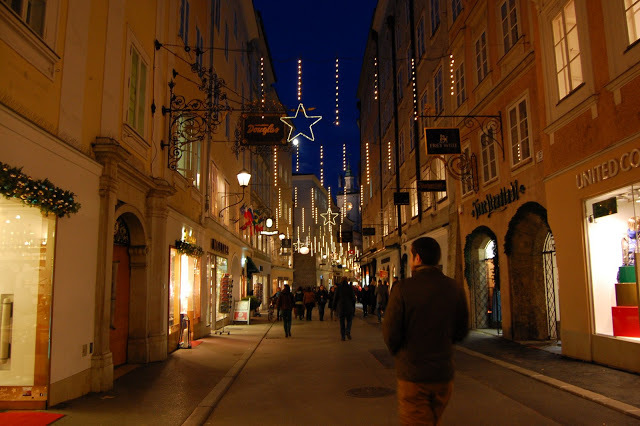 In Munich, Salzburg and Zagreb the advent markts were going in full force. Salzach River and Salzburg looking beautiful. I’m sure the holidays in Europe get just as commercialized as here in the states, but as an outsider it felt different. It felt authentic. As you prepare for Thanksgiving (and perhaps for the start of Advent on Sunday), try not to let all the Black Friday news and sales and commercialism get you down. 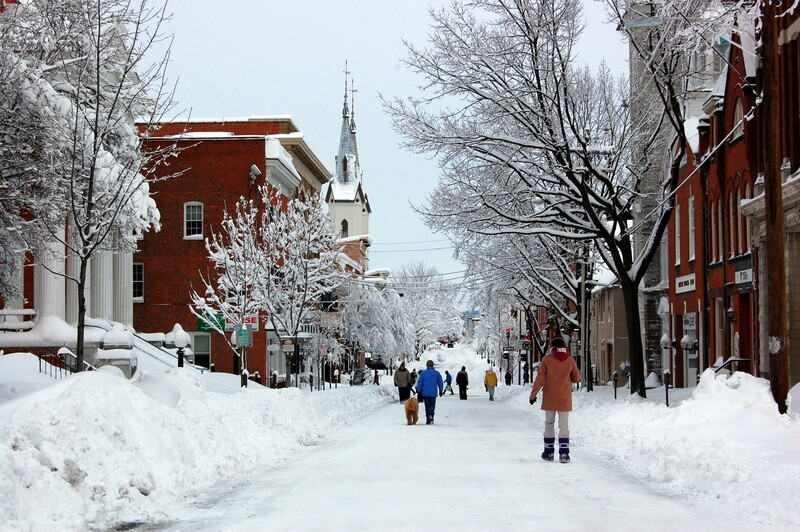 Head to downtown Frederick on Friday and, instead of Black Friday, celebrate Frosty Friday. 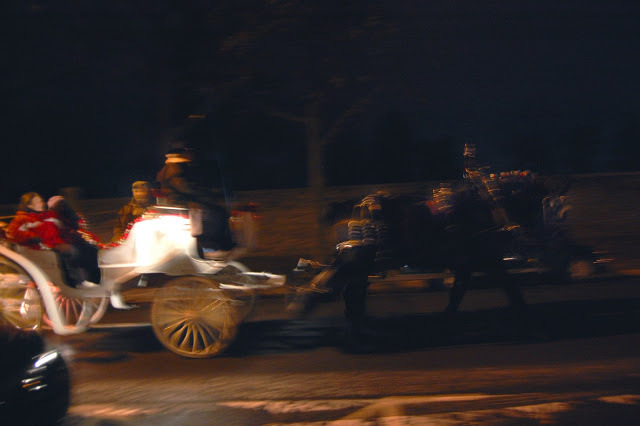 Free hot cocoa, Santa Claus, carriage rides – what’s not to like? Next weekend, head back to downtown Frederick and make your way to the Evangelical Lutheran Church’s ChristKindleMarkt. From December 6 to 8, enjoy German music, traditional market food (like bratwursts! ), and handmade Christmas gifts. It will be like I’m back in Europe. 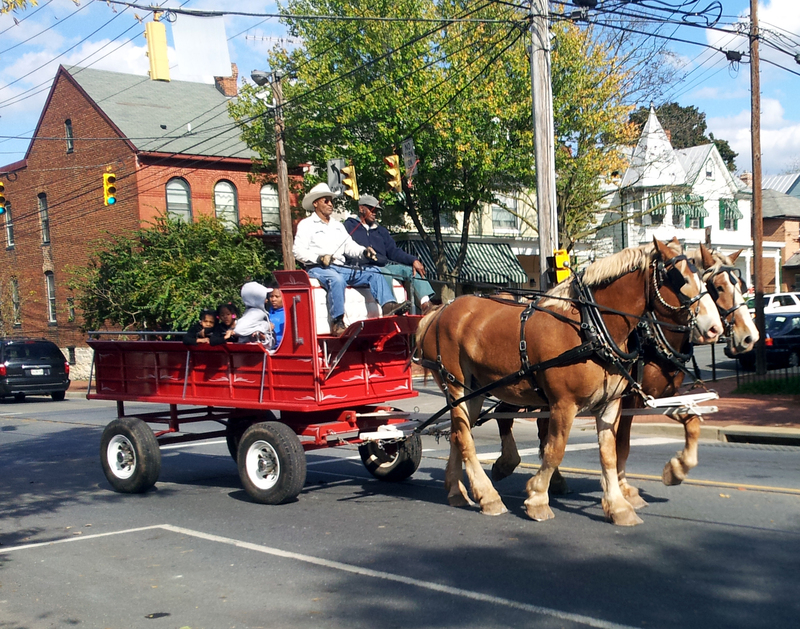 One year I opened my front door and this was sleigh bells ringing right down my street in Frederick’s historic downtown. I love living in Frederick, Maryland. It’s just so photogenic. But that’s not the only reason. If you ever wanted to experience Frederick, this is the month to do it. Throughout the month you can check out Artomatic (a huge art show in two abandoned buildings downtown), September 14 is In The Street, there’s the fair, Oktoberfest and more. As for me, I hope to be spending some evenings looking at this scene as the leaves change and the temps cool down. The Worthingtons used to live here. I imagine them sipping iced tea (or something stronger) on a swing on that porch. Or sitting on a picnic blanket from just this vantage point so they can see their stately home and the mountains in the background. They probably said yes ma’am, no sir, and y’all. And they probably called every woman “Miss.” I won’t lie. I love the South. Even if this is just a couple dozen miles from the Mason Dixon line. The Worthington home, in Frederick, Maryland, is definitely the South. I’m a big Gilmore Girls fan – the rapid witty dialogue, the impossibly close mother-daughter relationship, the quirky Connecticut Ivy League ways. It is one of those shows that I can watch over and over and find myself laughing at jokes again and again. One of the best parts about the show is the fictional New England town of Stars Hollow where Lorelei and Rory Gilmore live. 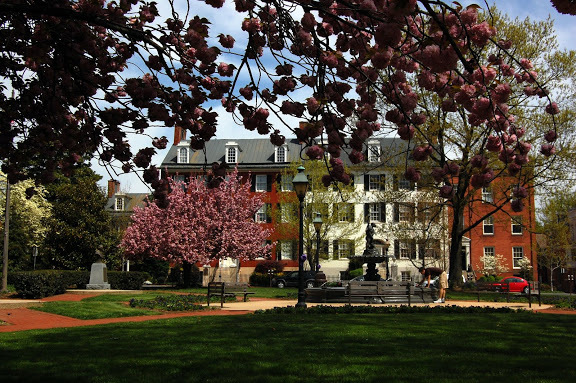 When I moved to Frederick, Md., with my husband four years ago, I began to notice similarities between Frederick and Stars Hollow. Always a mental tally in my head, I thought these deserved to be cataloged and saved. 1) Our mayor owns a bagel shop downtown, much like the mayor of Stars Hollow, Taylor, owns a small grocery store in the middle of town. 2) We have well preserved historic buildings and houses and a walkable downtown. Sometimes it feels like living on a movie set. 3) One night, my husband and I saw seven police cars driving and parking the wrong way down our one-way street. Policemen were sprinting from their cars down the street. We assumed something huge was going down. A few days later we saw in the local paper that they were chasing a man who had stolen a wallet and was hiding in a bush on our street. A wallet thief. Seven police cars. 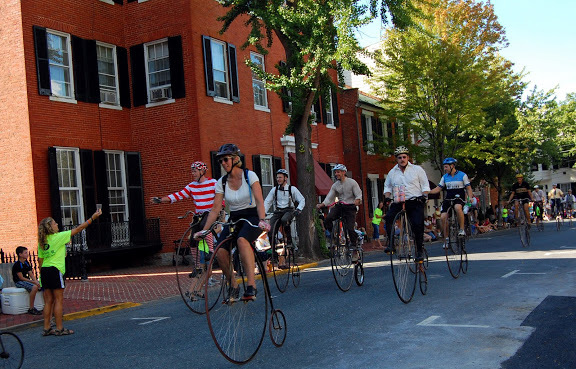 4) Frederick is the only town in America to have a high-wheel race. 5) We have a Civil War Medicine Museum. 6) We have a Railroad Museum. 7) I was literally composing this post when I saw the following making its way down the street. 9) Throughout the year we have festivals, events and other small town charming events. 10) On any given day, you can find something like this happening in Frederick. 11) Our park has a gazebo. Much like Stars Hollow. Not a picture of the gazebo, but this is Baker Park. 12) We have antique stores, a dance school, bakeries, floral shops, barber shops, restaurants and inns in our downtown. 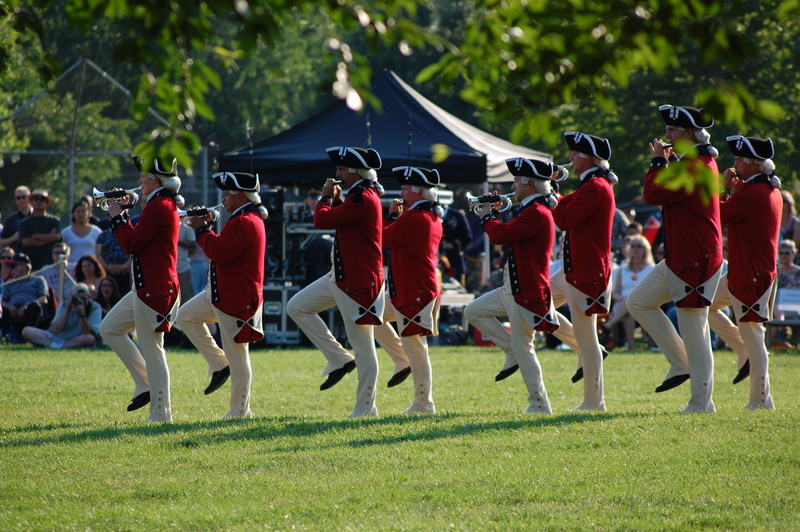 13) Revolutionary War and Civil War reenactments? Yes, we have those too. 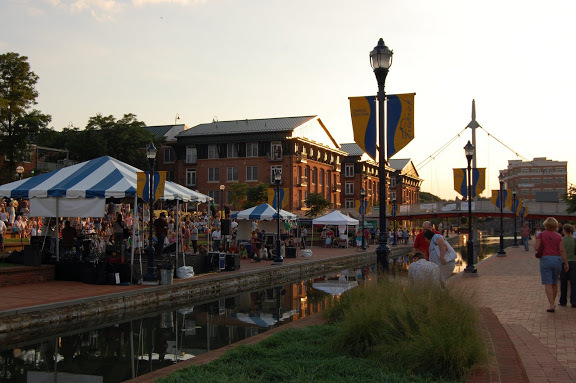 14) There’s a “cast” of Frederick characters – the drummer man who plays air drums with a pair of drum sticks all around town, the former newspaper man who is always seen walking his dalmatian, the shop owners who remember you if you visit their store fairly regularly, the tattoo kids at Nola, the Bernard, etc. etc. 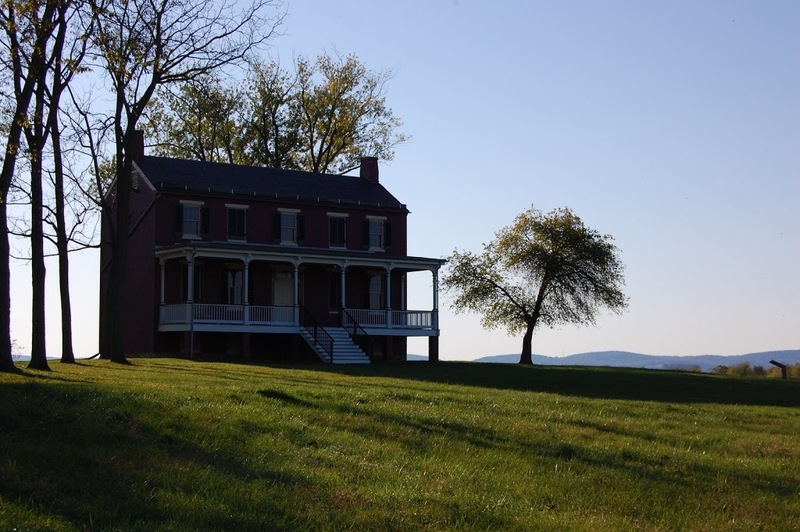 Remember that time General Lafayette stayed here? As I was watching Gilmore Girls while living in suburbia Louisiana, I could never have imagined that one day I’d be living in a pretty-much-real-life Stars Hollow. And I absolutely love it – quirks and all. I could probably come up with 15 more, but I want to know – what did I leave out? Tell me in the comments. Update 1/30/16: I couldn’t resist – I came up with eight more reasons here. Welcome to the blog. I’ve been blogging for about 10 years now (LiveJournal counted as blogging, right? ), but this is my first “professional” blog. I’m glad you’re reading, and if you want to learn more about the S.Y. Ciphers blog, I’d suggest starting on the About page. For now, I’d like to introduce myself. I’m a professional news writer. I currently write for a health care association, contribute to a local magazine, and write for other online pubs. I was born on the bayou in South Louisiana (seriously, you couldn’t get more South than where I lived or you’d be in the Gulf of Mexico). 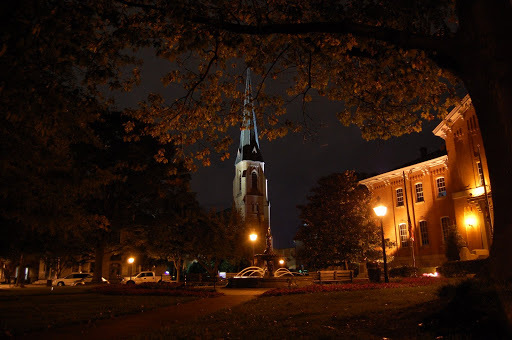 I’ve lived in Frederick, Maryland with my husband for the past 4 years. We’re huge fans of this quirky historic town. 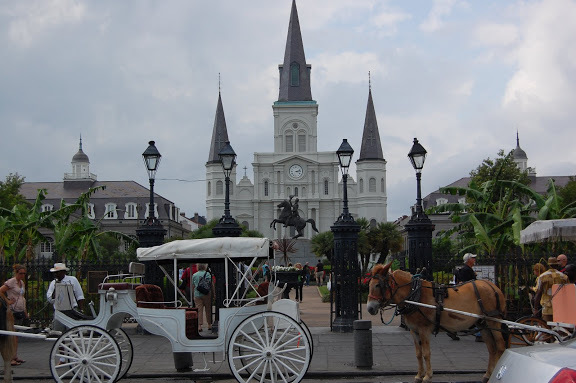 Before that I lived north of New Orleans and in Baton Rouge (while attending Louisiana State University for my bachelor’s and master’s degrees in journalism). My first paid writing gig was for an independent campus newspaper. I got the job my sophomore year at LSU. I remember being worried that I was thinking of story ideas in the shower, and for about a day I wondered whether I had chosen the right profession. But then I realized I was just passionate about what I did, so brainstorming in the shower wasn’t so bad. (Yes, I still come up with great story ideas in the shower). I would never turn down a crawfish or crab boil. I like being active and playing sports – running, biking, lifting weights, playing soccer, hiking, etc. My husband and I love to travel (but who doesn’t?). Recently we spent three weeks in Spain and Portugal. Some of the top places we’ve seen are: hanging out with Highland Cows on the Isle of Skye, Scotland; lazily wandering along the canals in Amsterdam; watching the botafumeiro in the Santiago de Compostela Cathedral in Spain; attending mass at the Mezquita in Cordoba; touring the Lavra Caves Monastery in Kiev, Ukraine; hiking Rocky Mountain National Park in Colorado; and seeing humpback whales dance around our boat in the Pacific Ocean a few hours outside of San Francisco. I think the best writers are also the most prolific readers. I’ve been averaging about 50 novels a year (or 1 a week).